Posted by Dr Dog. February 7th 2019. Many of us know that anxiety can be crippling and debilitating. Dogs can suffer too and without the necessary language skills to tell us how they feel. Firstly, you need to make sure that you’re getting the basics right. Exercise is the perfect natural stress reliever for both humans and dogs alike. Make sure that your furry friend is getting enough outdoor walks every day. 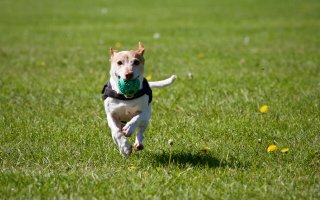 Lots of walks, runs, games, swimming and fun will allow your dog to burn off excess energy. It will also help them to live longer, healthier lives. It may sound like a no brainer, but before you delve more deeply into the subject of anxiety, you need to ensure that these basics are taken care of. 2. Diagnose anxious behaviour – with the help of your vet! Anxiety in dogs can present itself in many ways, including excessive barking, excessive grooming, trembling, hiding and physical problems such as diarrhoea. These symptoms and behaviours can also be linked to other illnesses and conditions, so if you think your dog may be suffering from anxiety, it may be prudent to speak to your vet to rule out anything else. It might be pretty simple to pinpoint the cause of your dog’s anxiety – you may have welcomed a new baby, bought a new puppy, moved house or the dog might be scared of loud noises such as fireworks. If the cause of your dog’s anxiety isn’t quite as straightforward as that, it could be worth keeping a diary to write down when the dog is displaying symptoms and potential reasons or activities that have preceded them. This may help you to understand the reasons behind the dog’s anxiety, which will help you to find the right solution or treatment. It sounds silly, but keeping calm yourself will work wonders. In the same way as it’s counter-productive (and mean!) to get mad with a tantruming toddler, getting cross with your dog won’t help. It’s also important to note that punishing anxious behaviours will only seek to make the anxiety worse. Keep your cool and work with your dog to help. Lots of cuddles, affection and human attention will be much better appreciated and will help to alleviate the fears of an anxious or fearful dog. There are a plethora of products and natural remedies on the market for anxious dogs. But always consult with your vet first regarding the various options. Potential products you can discuss with your vet include anxiety jackets which work on the same principle as swaddling a baby and pheromone-laden sprays, collars and plug-ins, which may be able to help your dog cope with the stresses and strains of life! Another option your vet may recommend could be medication. If your pooch seems like they are a little anxious, make sure they have pet insurance in case they require treatment. Visit www.argospetinsurance.co.uk to find out more information about our policies.